In 2006, Mr. Hill interviewed Dr. Mark Fleming, a medical oncologist with expertise in prostate cancer, who was new at that time to the Hampton Roads area. Dr. Fleming shared Mr. Hill’s passion for organizing a program to save lives of patients dying from prostate cancer. Seeking collaboration and commitment, Mr. Hill’s interview resulted in additional meetings with Dr. Fleming, Dr. Richard Rento, a respected urologist with more than twenty years of experience in treating and caring for men with prostate cancer, and Golden Bethune, a Nurse and Hospital Executive who cared for patients and family members including her father with prostate cancer challenges. This core group met several times and decided to organize the Forum. Initially, the group focused on helping other men navigate the medical community and on reducing the number of men who suffer and die needlessly from prostate cancer. The founding members decided that due to the regional history, a 501 (C) (3) non-profit organization would increase the group’s chances for success. The group concluded that the non-profit organization would provide a non-competitive forum that would allow member organizations to fully engage and exchange expertise and ideas without the distractions that usually accompany undertakings like this. In the spring of 2007, the group developed a position statement to capture and communicate the purpose and scope of the Forum. 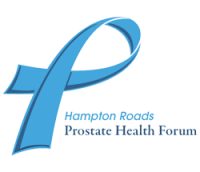 Founding members then invited representatives from regional health care organizations, Hampton Roads employers, and medical experts in prostate cancer to be a part of the Forum. The first meeting of the proposed Board of Directors was held September 26, 2007.